William Bomford (Chapter 13) had 8 brothers and sisters, the sons and daughters of Thomas Bomford of Clounstown and Cushenstown born 1703 (2.22), BA (TCD) 1725, married 7th September 1729 (ML) (3.4), and died 1757 (7.18). The children’s mother was Jane (Shinton) who died in Dawson Street in 1784 or 85 (14.4). See also the family outline at 11.4, and the further summary of Thomas' family at 14.13. 2. Frances (14.12.3), born c1731 at Clounstown, married 26th February 1753 (7.16), also at Clounstown, Robert Madden of Meadesbrook, and died between 1761 and 1764. There were three children, Anne Madden, Rev John Madden and Robert Madden (7.16.1, 13.4). 3. Anne (14.12.1), born c1733, married January 1759 her cousin Wilson Bomford (12.2.5). She had three children, Laurence, Thomas Shinton, and Wilson (12.2.8/9/10), before she died between 1764 and 1784. 4. Elizabeth (14.12.2), born c1735 and died unmarried between 1764 and 1783. 5. Thomas of Clounstown, sold 1784 (14.5.1), then of Harristown, Co Westmeath. He was born in 1739, married 12th January l764 (ML) (14.1) and died c1796 (14.2, 14.8). He was survived by his wife, Alice Jessop, of Mount Jessop, Co Longford. There were three children, Thomas (14.8.1), Robert (14.8.2)and John (14.8.3). Robert inherited Jessop property and took the surname Bomford-Jessop. 6. John (14.10), born c1740, was apprenticed with his brother Thomas and became a merchant in Dublin. He married firstly on 27th November 1766 (ML) Dorcas Ahmuty of Co Longford; married secondly in 1780 Mary Ann, the widow of Mr Barrington. In 1780 he moved from Dublin to Killincarrick Co Wicklow. John had no known children by either marriage. 7. Emilia (14.12.4), born c1742, married 1781 Robert Harrison of Santry, Co Dublin There were no known children. 8. Jane (14.12.5), born c1744, married c 1st January 1770 Samuel Heally (14.4.1). He died before May 1784 and she after that date. There were two children, Gabriel and Samuel Heally. 9. Christian (14.12.6), born c1746, married firstly Francis Hopson in 1782 (ML), and secondly before April 1783 Christopher Russell of Dublin. They may have had children, see text. Here is another family whose birth dates are approximate and judged from other family events. Only Thomas has a definite birth date. 3. Townley Ahmuty of the City of Dublin, merchant, and William Forbes, Alderman of the City of Dublin. On the marriage about to be had between Thomas Bomford and Alice Jessop, and with the marriage portions of £1,000 and £200, Thomas Bomford did lease to Townley Ahmuty and William Forbes in trust the land of Clounstown in the Barony of Skreen containing 335 plantation acres (543 statute) for an annuity, on the death of Thomas Bomford, to Alice of £100. Thomas, second son of Thomas of Cushenstown and Clounstown, appears to have inherited Clounstown from his father who had died in 1757; his elder brother William got the other property of Cushenstown, which had more acreage attached. Thomas was born in 1739 and was 25 when he married. The trustee Townley Ahmuty was a brother of Dorcas Ahmuty who in a couple of years will marry John Bomford, the other brother of Thomas. The other trustee William Forbes, the alderman, died in 1776. Wilson Bomford was Thomas’s cousin and brother-in-law, the brewer and distiller. He married Anne, one of Thomas’s sisters, in 1759. Robert Madden was also a brother-in-law; he married another sister, Frances, in 1753. The licence was issued by the Diocese of Dublin and reads “Bomford Thomas of Colounstown, Co Meath, Esqr, and Alice Jessop of the Parish of St Michan’s, Dublin, spinster. Directed to said parish 12th January 1764” (Page 443). Marriages from Exshaws and Hibernian Magazines Vol 1, page 54. Their marriage probably took place on 12th January 1764 since both the marriage settlement and the licence are of the same date, but we cannot be certain so it has been dated just January 1764. They were married in St Michan’s Church in Dublin, which is on the north side of the Liffey, beside the Four Courts. This Church stands on the site of a Danish church said to have been built in 1096, it was restored or maybe rebuilt in 1686 and again in 1828. A fine organ was installed in 1724 on which, some say, Handel played when he visited Ireland in 1742. The vaults are notorious; they are cut out of limestone which is so absorbent as to prevent decomposition and to cause an unusual form of soft mummification; thus, where the coffins have collapsed, the bodies can be seen, dried and sunken but still recognisable and covered with skin and hair; before the war tourists were invited to ‘shake the hand of the Crusader’ but this macabre practice has now been stopped. An early clue to the family was found in the 1884 edition of Burke’s General Armoury which records “Bomford - see Jessop”. 1. “Daughter Frances J” who may be a natural daughter but is more likely to be the daughter-in-law, Frances wife of son the Rev Thomas. 2. “Grandson Thomas J”. This is a difficult one to place, he must have died fairly young, certainly before 1825, otherwise he rather than the Bomford grandson, Robert, would have inherited Mount Jessop that year. He must be a son of either Robert or Rev Thomas Jessop, the only two sons. 1. The family tree of “Bomford of Cushinstown, Co Meath” which has been used extensively in these records; in particular it shows the relationship and offspring of Robert Bomford who became Robert Bomford-Jessop. 2. The Chancery answer of the Rev Thomas Jessop in the action of Thomas Bomford v Rev T Jessop. This is a long document, which is recorded in full below (14.9). It makes astounding reading but it is apparent that Mount Jessop was originally to be left to the elder son of Thomas and Alice Bomford, Thomas Bomford, but because of his actions he was disinherited and the place went to the second son, Robert Bomford. A number of others in the Jessop family are mentioned in the document and the tree below brings in all these so that a fuller picture can be built up. Additional information. For considerably more information on the Jessop family, see the Jessop entries at www.longfordancestry.com. Thomas Bomford of Clounstown, Co Meath, leases to Robert Madden of Meadesbrook, Co Meath, the land of Brick for the unexpired number of years and at the same rent as the previous lease which was dated 13th July 1724 (3.2.1) by the Right Honourable Earl of Meath to Thomas Bomford of Rahinstown, the father of the said Thomas Bomford, for 61 years at the rent of £28. Three different Thomases are involved in this deed. In 1724 Thomas of Clounstown, the 2nd son of Oliver, was a minor; his guardian was Thomas of Rahinstown, his uncle and son of Colonel Laurence, who is here incorrectly recorded as his father. Thomas of Clounstown died in 1757 and Clounstown was left to his second son, Thomas. It is this younger Thomas who is leasing Brick containing 125 statute acres to his brother-in-law Robert Madden until the original lease of 61 years expires in 1786. Jane’s husband, Thomas the elder of Clounstown, died in 1757, 28 years before Jane died, leaving about six of his nine children as minors. Those mentioned in her will are mostly her children, the brothers and sisters of William, her eldest son. Jane Bomford of Dublin, widow, 21st May 1784 (will), 19th May 1785 (probate). grson Gabriel H, Samuel H.
Thus we can state that Jane Bomford died in Dawson Street, Dublin, in the early months of 1785. There are a couple of errors in the will: Thomas was not her eldest son, William was, and Wilson was not her son but her son-in-law, the husband of her eldest daughter Anne. It has always been rather difficult placing all these early Thomas Bomfords. 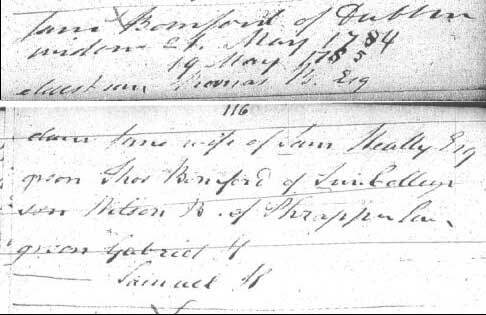 No doubt it was from this will that Upton places Thomas as the son of Wilson when he states “Thomas Bomford, student, TCD, 1784”; the Trinity Register gives more information (12.2.9). For a long time I was puzzled over ‘Phrappulan’ until the matter was clarified in a Dublin Almanack: it is not the name of a house but it should read ‘Phrapper Lane’. The Jane Bomford who married Samuel Heally was the fifth daughter. I have found no other confirmation of this marriage, nor of the two sons, Gabriel and Samuel; the two sons are not mentioned again but we could assume that Gabriel Heally was born c177l and Samuel c1773 so at the time of their grandmother’s will they were aged about 13 and 11. The next four documents concern the sale of Clounstown. The rents of Cumberstown were granted by John Rochfort in 1762 to pay for the education of the children of Thomas and Jane (Shinton), the parents of Thomas and Christian of the deed (7.18.1). 1. Emilia Bomford of Meadesbrook, Co Meath, spinster. (She does not marry for another three years and is now living with her brother-in-law, Robert Madden, at Meadesbrook). 2. Jane Bomford otherwise Heally of Dublin, widow. (Samuel Heally died early in 1784). 3. Joshua Huband of Balligorn, co Kildare, executor of the will of Christopher Russell, (this might be the Christopher Russell who married the youngest daughter, Christian, but it is more likely to be the father, an older Christopher), and Christian Russell otherwise Bomford late of Dublin. 4. Augustine Penthony of Glasgo, Co Kildare. Emilia Bomford, Jane Heally (Bomford) and Christian Russell (Bomford) were all daughters and Legatees named in the will of Thomas Bomford the elder of Clownstown. The will (7.18.1) left £300 each to the daughters – Anne, wife of Wilson Bomford, Elizabeth, unmarried, Emilia, Jane and Christian. Since Anne and Elizabeth are not mentioned in the 1784 document it can be assumed that they are dead. The other married daughter, Frances Madden died between 1761 and 1764 (14.12.3). 1. Thomas Bomford the elder possessed Clownstown fee farm which he mortgaged to Mark White for £816.6.1 (7.11), and which he charged with £300 a piece for his daughters. 1. The Right Honourable James, Earl of Clanbrassill, Chief Remembrancer of His Majesty’s Court of the Exchequer. Christian Russell, otherwise Bomford, wife of Christopher Russell. John Lowther of Staffordstown was named as an executor of the will of 1764 (7.18.1) of Thomas, together with John Jones who must have died. Owen Daly is not the husband of Anne, daughter of Edward Bomford of Hightown (8.3), who died in 1747 (8.9.2), but he may be one of Anne’s nephews. Witnessed Owen Daly and Joseph Cavenagh (Book 402 Page 175 No 264683). Clounstown was sold in 1784 for £4,500 to pay for its mortgage and the settlement on the children, both having been arranged by the father Thomas the elder and his wife Jane (Shinton). This is all quite normal but the father’s debts and settlements were usually settled by the eldest son, who was William, and not, as in this case, by the second son Thomas. We are left wondering about this and also about the will of Jane (Shinton), the mother (14.4). Why did she omit William and call Thomas her eldest son; was this deliberate and had William disgraced himself? We simply do not know, but the records show that something odd had occurred. In any event Thomas and Alice did not have enough money to cover the mortgage and bequests, and had to sell and leave Clounstown. In 1784 they settled in Co Westmeath at Harristown. No record has been found of Harristown but there is a Harrystown of 168 acres on the Shannon just south of Ballymore which is about 10 miles north-east of Athlone. Thomas Bomford of Harristown, Co Westmeath, leases to Christopher Barden of Parsonstown, Co Westmeath, the mill and land of Cyplin for 21 years at a rent of £10. Witnessed Oliver Bomford, Publican (He cannot be placed and to date remains a mystery man: see 14.8.4 and 17.12) (Book 411 Page 359 No 271964). There is no record to date concerning Cyplin; it is not known where it is, how it became Thomas’s or how much land it contained. Its lease appears to end in 1805, but in November that year it is mentioned in the marriage licence of Thomas’s son, Robert. The marriage licence states “Bomford, Robert, of Cyplin in Co Westmeath,” so it is possible that the lease was not terminated then but renewed. Indeed: see 14.8.4. On the other hand the lease (14.3) of Brick, near Clounstown, was terminated in 1784 even though it could have run on for another two years. Thomas Bomford of Ardnacraney, Co Westmeath, leased to Rev John Waldron and James Wynne the land of Ardnacraney containing 59 plantation acres (96 statute) in the Parish of Noughville for three lives or 31 years at a rent of £61.4.3 (Book 493 Page 395 No 323525). Most probably Thomas bought Ardnacraney well before this date whilst he was at Harristown, and this lease represents only a portion of his purchase. It is about 2½ miles from Harrystown, which, as said before, may be the unplaced ‘Harristown’. There are two adjacent townlands, both named Ardnacraney, in the Parish of Noughaval in the Barony of Kilkenny West. 1. Ardnacraney North of 813 statute acres, which lies between the road from Ballymore to Tang and south of the River Tang. Ardnacraney House is in the south corner and this may have been where Thomas and Alice were living. To the north of the house is a monastery, founded in the 14th Century for the Carmelites by Robert Dillon of Drumraney. 2. Ardnacraney South of 162 statute acres touches Ardnacraney North at the crossroads and runs south and east along the road two miles from Ballymore. It is not known how much of nor which Ardnacraney Thomas leased. Ardnacraney is in the middle of the Goldsmith country. As Lewis writes in 1838, “Goldsmith, the poet, was born at Pallice (Pallas) on 10th November 1732, now a collection of mere huts, in the Parish of Forgney, and lived there as a child with his widowed mother. His youth was spent at Lissoy, later called Auburn, in Co Westmeath, on the road to Edgeworthstown, the home of Maria Edgeworth (1767 - 1849).” He died in 1774 so would not have been known to Thomas and his family. The above deed of 1796 is the last entry concerning Thomas Bomford and Alice (Jessop) of Harristown and/or Ardnacraney. In 1796 Thomas was aged 57 and appears to have died later that year. They had at least three sons whom we know about and there may have been daughters as well. The eldest son was Thomas who was born about 1764 and so in 1796 his age was about 32. The court case which follows (14.9), about his mis-spent youth, is all we know about him. He may have married but having estranged himself from the family and without money he must have sunk pretty low, at any rate he disappears from sight. A little more information comes from the Upton Papers; Martha Battersby was the daughter of Francis Battersby of Hightown, Co Westmeath. There were a number of Battersbys scattered around Westmeath and Meath at this date, but no trace of Francis of Hightown has been found. He does not appear in the lineage of the Battersbys of Loughbawn. Hightown had been a Bomford property from about 1700 until 1790, and Colonel Laurence’s son Edward (c1690 - l756) lived there, but there is no evidence in the Bomford deeds of Francis Battersby leasing the place. It is, however, quite possible that Francis Battersby lived in Hightown House, although he and his daughter must have had a town house in 1805 near O’Connell Street in the Parish of St Thomas according to the marriage licence. See additional information and the Bomford-Jessop family entries at www.longfordancestry.com, from which much of what follows has come. Robert Bomford and Martha had seven children, all of whom were born ‘Bomford’, but on 11th May 1825 their father took the name and arms of Jessop so they all became ‘Bomford-Jessop’ or perhaps just 'Jessop'. Robert’s uncle, the Rev Thomas Jessop of Mount Jessop died on 24th April 1825 and left his property to Robert. Robert, Martha and the children moved to Mount Jessop. Robert died on 2 March 1834 and was buried in the Moydow Churchyard where a gravestone with his coat of arms states, "Under this lie the remains of Robert Jessop Esqr who died the 2nd of March 1834 aged 61 years". After Robert's death, Martha went to live in Dublin at Waterloo Road and died there on 30th April 1854 in her 67th year. She is buried in Mount Jerome Cemetery, Dublin. 1. The eldest son was Francis Jessop, born c 1809 and died 12 February 1836 at the age of 27, having shot himself that morning in his bedroom at Mount Jessop. His remains were interred in the family vault at 4am the following morning. James P Farrell in his book, Historical Notes of County Longford states at page 166, "He [Francis Jessop] was an officer in the Army [60th Rifles, King's Royal Rifle Corps] and had a fine prospect before him, but desired to marry an inferior in rank to himself, with whom he was in love. This he guardian, Sir George Fetherston of Ardagh, would not allow, and the young man grew melancholy thereon, and died by his own hand." This explanation is quite likely, though it is hard to explain Sir George Fetherston's action. Francis was a grown man of 27 years, a landowner, an officer in a crack regiment and had just been made High Sheriff of County Longford. It is unlikely that such a man would have a guardian who had so much power over him. 2. Catherine Jessop, b c 1810, married 28 January 1835 at St Anne's Church, Dublin, William Dawson of Nohaville, Ballymahon, Co Westmeath. Nohaville (Noughaval) is just to the east of Ardnacraney where Catherine's grandfather Thomas Bomford lived. William Dawson died in 1883. There were at least two sons. b. Robert Edward Dawson of Nohaville, b 1838, married 1864 Annie Eliza Kemp, only daughter of Hon Charles Kemp MLC of Sydney NSW. Robert Edward was a Captain of the 12th Foot (Gloucester Regiment) and Captain of the Westmeath Militia. He became a magistrate for Co Westmeath and hon Major, 3rd Royal Warwickshire Regiment. He had a son, Charles Kemp Dawson, b 1870, and other children. 3. Frances Jessop, b 1814 and married December 1836 Henry Dopping of Erne Head, 2nd son of Ralph Dopping 1765-1818. He was b 1807, JP, High Sheriff 1861, and died 30 January 1883 (9.3.6). She died 31 August 1887 and was buried in St Patrick's Churchyard, Granard. They had a boy and a girl. a. Rev Francis Henry Dopping, 1838-1907, Rector of Columbkill, Co Longford. He married and had two daughters. b. Henrietta Charlotte Martha Dopping, who died 19 November 1911. 4. Elizabeth Anne Jessop, known as Eliza, born c 1816 and married in Dublin 10 May 1851 John Fleming, son of William Fleming of St Peter's, Dublin. 5. Henrietta Amelia Jessop, married firstly 15 August 1839 at Moydow Church, Co Longford, William Hodson Neligan of Emblamore, Co Roscommon, and secondly on 9 February 1861 at Abbeylara Church, Co Longford, John William Finch of Kilcolman, Co Tipperary. She had one child. a. Emily Ada Frances Neligan, d 5 Jan 1854 aged 9, buried at Mount Jerome Cemeteryy, Dublin. 6. The second son, John Thomas Jessop was born c 1822 and inherited Mount Jessop in 1836 (when he was about 13) on the death of his brother Francis. He married (1) 7 September 1844 Maria Lucy Copland, born c 1827 and aged 17 at the time of her marriage, eldest daughter of Alexander Copland of Portman Square, London. John was made Justice of the Peace in 1845 and in 1846 High Sheriff of Co Longford. In June 1861 Maria Lucy obtained a divorce on the grounds of adultury and desertion, but the jury found John not guilty of cruelty. They had lived (more or less) together though largely not at Mount Jessop only until 1847, after which Maria lived with her mother. "The marriage proved to be a singularly unhappy one. The husband soon became addicted to drink and gambling; he was in point of fact a drunkard." In October 1847 John risked Mount Jessop and the estate "on a game of chance at a ball in the Military Barracks of Longford, losing them, as well as every penny he was possessed of, in one night" (James P Farrell, Historical Notes of County Longford, p 316). An execution was put in place on Mount Jessop in October 1847, and the place was sold in the Court of the Commissioners of Incumbered Estates in 1850. John Thomas Jessop married secondly Anne Nugent Briscoe, born 1832, widow of Thomas Brown and daughter of John Fetherston Briscoe. They had seven children so this second marriage was much more successful than the first. John died on 23 March 1880, aged 58, at 15 Regent Square, London. Anne Nugent Jessop died 23 July 1879 aged 47. They were both buried in Norwood Cemetery. a. Martin Jessop, b c 1859 at Brompton, Middlesex. b. Emily Jessop, b c 1861 at Exeter, Devonshire. c. Anne Frances Nugent Jessop, b c 1862 in London, married 13 November 1888 Archdeacon Richard James Clarke, 1856-1953. She died 9 September 1942 having had four children. i. Henry Jessop St John Clarke, Reverend, b 27 December 1889. Served in WWI and WWII. Married 11 August 1920 Nancy Marguerite Jamieson, only daughter of Simpson Jamieson of St Andrew, Scotland. They had two sons and a daughter. ii. Maude Violet Clarke, b 7 May 1892, author, died unmarried 17 November 1935.
iii. Bruce Richard Clarke, MC (1917), consultant physician, b 12 May 1895. Married 11 July 1928 Doreen Matilda Graham Cassidy, youngest daughter of Samuel Cassidy of Lunvady, and had two sons. iv. Stewart Studdart Clarke, b 11 January 1897, served in WWI as Lieutenant RA. Drowned off Selamis 3 May 1929.
d. John Jessop of South Africa, b c 1864 in Belgium, d unmarried. e. Catherine Jessop, b c 1867 in Brussels. f. Eleanor Jessop, b c 1870 in Berkshire. g. Samia Jane Frances Jessop, b first quarter 1871 at Hounslow, Middlesex. 7. Emily Caroline Jessop b c 1825, married firstly 28 January 1840 at Moydow Church, Co Longford, Major Gillis Macpherson and secondly on 20 September 1856, Captain James Fielder Peto. She had two children, one being Gordon Macpherson. The only record of the third son, John Bomford, is in the court case of the eldest son. He is not mentioned in the Upton Papers but if he was the second born son he would be likely to have been born between 1764 and 1773, say about 1768. His daughter Elizabeth was married in 1805 (14.8.6), so he may have been a little older, perhaps born in the early 1760s. There were Bomfords living in the Westmeath or Longford area within living memory. Fairly recently I met people who visited them with Hilda North-Bomford, but they do not remember their names nor where they lived, just ‘somewhere north of Athlone’. Joan David also remembers that there were Bomfords who lived ‘somewhere in the west’, and both these descriptions could cover the Longford-Westmeath area. Even more recently in May 1987 the name “Mrs H. Bomford” was noticed in the Diocesan Magazine and I visited her at Corbetstown, a couple of miles from Killucan on the Delvin road. Mrs Henrietta Bomford was then 82 years old and did not remember much about her husband John’s family; however she was sure that she was the last Bomford in that locality. What she did remember is recorded in 17.5.6. It must be remembered that my research is by no means complete, but it is a start and much has been discovered. Only a few years ago Oliver, the Colonel’s second son, had virtually been forgotten, and all trace of his family had been ‘lost’; his family is now beginning to make sense, but as the family moved away from the land so it becomes more difficult to trace them with continuity. So Oliver’s family in particular is ‘open ended’ and many of the unplaced Bomfords will belong to his branch. Much the same can be said of the family of another son of the Colonel, Laurence of Killeglan. More recently a Bomford connection, Jim Bomford, got in touch through the Internet. He produced much of the following concerning his antecedents and about “John, born 1763, of Ballinakill”. Ballinakill is on the south shore of Lough Derravaragh in the Parish of Multyfarnham and northeast of that village. To the south are the lands of Farragh and to the west is Lackan which both belonged to Thomas the elder of Clounstown and then to his son, Thomas, who moved from Clounstown to Harristown in Westmeath in 1784. The neighbouring parish to the east is Stonehall, which includes the estate of Mornington (Monintown), the property of Owen Daly (1780-1847); he was the grandson of Owen Daly and his wife Anne (8.3), a daughter of Edward Bomford of Hightown. So Ballinakill is surrounded by Bomford history. Another property about six miles to the east of Ballinakill is Cumberstown which lies at the east end of Lough Lene: This is a mystery property as no Bomford lease has come to light, but it does appear to belong to Thomas Bomford of Clounstown in 1762 when its rents were placed in trust for the maintenance of his daughters (7.18.1). Then in 1783 (14.5) the rents were set aside by his son, Thomas Bomford of Harristown, to cover the debts on Clounstown. There was therefore a definite tie between Cumberstown and Thomas of Harristown, so much so, that the John Bomford of Cumberstown (see below) of 1832 must be closely related, perhaps a grandson. A further clue to John Bomford of Cumberstown is in a list of tenants of Wilsons Hospital (1.10.1, 7.9.1). John Bomford has 128 acres of Cumberstown for 21 years from May 1796 at a rent of £89 a year. Also on the list are "Ju and Rob Bomford", who have 182 acres at Syphin for 21 years from 1805 at £182 per year. Syphin seems likely to be Cyplin (14.6), a mystery property that Thomas Bomford of Harristown leased in 1784, and I begin to suspect is part of Cumberstown. The reason why Cyplin is mentioned here is because the lease was witnessed in 1784 by the first of the unplaced Bomfords of Westmeath; his name is Oliver Bomford and he is described as a “Publican”. Other Bomfords named Oliver will appear shortly. "Ju and Rob" Bomford might be John (J'o) and Robert: see 14.6.1. Let us suppose that John was 30 in 1799 when he leased Ballinakill, and then he would be about 48 when he died in c1817. Therefore we are looking for a John Bomford with Westmeath connections whose dates are about 1769 to 1817, and such a John is there in the family tree. He is John the youngest son of Thomas Bomford and Alice (Jessop) of Harristown, (14.8.7), and brother to Robert Bomford who takes the name of Jessop and inherits Mount Jessop (14.8.2). Indeed there is no other John available in the family tree, but this John suits incredibly well and now with Jim Bomford’s further evidence, John of Lisgomell has been placed as the second son of Thomas Bomford of Clounstown and Harristown. Witnessed Edmund Connally and Oliver Bomford of Ballinakill. (Book 819 Page 562 No 551897). See 23.7.3 (5) for another reference to a John Higgins about this time. It is not clear how Ballinakill came to be divided into 7 parts. Originally it was all leased to John Bomford of Lisgomell in 1799 (14.8.4). John died in 1817 and presumably the property was split amongst his heirs, in sevenths. Oliver got some, as he is 'of Ballinakill' in the deed above. John Higgins and Anne Connell directly or indirectly ended up with a seventh part each, which they were prepared to lease to Oliver's brother Henry. It seems that John Bomford had some interest in Ballinakill in 1835, so it looks like all three brothers had some interest in the land. Before 1846 Henry died and Oliver inherited, because in 1846, Oliver mortgaged 131 acres of Ballinakill to his brother John of Blackhills, presumably to raise money. John then died in 1850 and Oliver leased the whole 131 acres in May 1850 to Andrew Christopher Palles of Dublin (14.8.6). It seems the mortgage continued because in 1853 John and Oliver's sister Elizabeth was entitled to the mortgage money under a decision by the Court of Perogative re John's property. But about the same time Oliver sold Ballinakill to Sir Percy Nugent, who then leased it back to Oliver in 1853. It is not clear whether the sublease to Andrew Palles continued after 1853, or whether Oliver held the land again himself. Henry's son Augustin might have inherited the land in the normal course of business, at least after Oliver died, but Augustin fled to the USA before he reached his majority (14.8.8) and it seems Ballinakill ended up in the hands of Sir Percy Nugent. In the Barony of Corkaree: Henry Bomford: Multyfarnham, house and lands, Ballinakill or Ballyfort (now spelt Ballinphort), (his landlord) Sir Percy Nugent, (property value £) 10, (remarks) no title. In the Barony of Demifore or Fore: John Bomford: Cumberstown, (property value £) 10. Rootsireland.ie has a transcription from a marriage record for Oliver Bumford bachelor and Bridget Colligan spinster on 8 October 1797 from the register of the Roman Catholic Parish of Devlin, Co Westmeath. The witnesses were Walter Malone and Elizabeth Colligan. There are no other details. Multyfarnham Parish History by Peter Wallace (1987) lists miscellaneous documents including land leases relating to Multyfarnham. At page 219 he includes "Henry Bomford/Tho Blackhall 1833" in Multyfarnham (as distinct from Ballinakill or other surrounding places, so this could have been a property in the village). There are no further details. In the same Miscellaneous section, under Ballinakill, Wallace lists "Jn Bomford 1835". Again, there are no details. At page 209, Wallace lists Oliver Bomford in Ballinakill as an entry under Tithe Books 1824-1833. Wallace reports (page 235) there were between 5 and 9 Bomford baptisms among the almost 2700 recorded in the Multyfarnham Parish Register between 1824 and 1849 inclusive. These records seem likely to be the children of Henry Bomford and Mary Kane. There was a Mary Bomford living in Ballindurrow, Multyfarnham, recorded in Griffiths 1854 valuation (http://ifhf.rootsireland.ie). An Anne Bumford (d 1787 aged 16) has a grave in the Stonehall cemetery, and Anne Bomford married Owen Daly of Mornington, Stonehall, perhaps in 1745 (8.3). Stonehall church closed around 1920 and Leney Protestant church closed in 1984. The nearest Protestant churches still functioning, and which may have inherited the parish records from the closed churches, are in Mullingar, Killucan and Castlepollard (Con Maxwell email 8 Nov 2006). Leney and Stonehall C of I Parish records up to c1870 were microfilmed in the 1950s and/or 1980s and are in the National Archive, Dublin (microfilm MFCI 62: Eva North email 30 April 2009). The originals and any post 1870 records may be in the Representative Church Body Library in Braemor Park, Churchtown, Dublin 14 – http://www.ireland.anglican.org/. They have not yet been investigated for further evidence of Bomford lineages. 6a Thomas Bomford, baptised 17 May 1828, Multyfarnham, Co Westmeath, Ireland. 6b John Nicholas Bomford, baptised 2 Oct 1829, Multyfarnham, Co Westmeath, Ireland. 6c Oliver Bomford, baptised 23 Jul 1831, Multyfarnham, Co Westmeath, Ireland. 6d Denis Bomford, baptised 22 Sep 1833, Multyfarnham, Co Westmeath, Ireland. 6e John Bomford, baptised 17 Jun 1835, Multyfarnham, Co Westmeath, Ireland. 6f Henry Bomford, baptised 13 Aug 1836, Multyfarnham, Co Westmeath, Ireland. 6g Anne Bomford, baptised 20 Dec 1838, Multyfarnham, Co Westmeath, Ireland. 6h William Bomford, baptised 1 Dec 1841, Taughmon, Co Westmeath, Ireland. 6i Augustin Bomford, baptised 18 Apr 1844, Taughmon, Co Westmeath, Ireland. 6j Teresa Bomford, baptised 17 Sep 1849, Multyfarnham, Co Westmeath, Ireland. Augustin married and had a family (14.8.8). To date, no further trace has been found of the other members of the family. ‘Co Meath’ must be an error; it should be Co Westmeath as in the 1846 mortgage. 1. Lease of 5th July 1799 (See 14.8.4, lease to John Bomford of Lisgomell). 2. John Bomford of Blackhills has since died intestate and without issue, leaving Oliver Bomford his eldest and only surviving brother his heir, and leaving Elizabeth Smith his sister. 3. That the Court of Prerogative granted Elizabeth Smith the goods and chattels of John Bomford. 4. Thus Elizabeth Smith is due the mortgage money of £300 which now amounts to £386.5.9. There is a further deed in the Registry of Deeds: Book 787 Page 450 Memorandum 532585 registered on 31 October 1825 is a memorial of an indented deed of marriage settlement dated 26 October 1805 for the then shortly intended marriage of John Smith of Bonington, son of Fiade Smith, and Elizabeth Bomford, a daughter of John Bomford of Stonehall, with Oliver Bomford of Stonehall as a trustee (Leonard Riley emails 13 & 15 Jan 2009; Eva North emails 17 Jan 2009). This deed confirms that Elizabeth is a daughter of John Bomford of Stonehall, and with the other deeds links in Henry of Ballinakill, Oliver of Stonehall and John of Blackhills as John's children, and suggests there was at least one other daughter. It suggests that John senior was alive in 1805. If he was born in 1765, he would have been 40 when his daughter was married in 1805. Bonington has not been placed. The deeds connect John Bomford of Lisgomell and Stonehall who was born about 1763 and died about 1817 with the other Bomfords of the deeds through the lands of Stonehall and Ballinakill and Elizabeth's marriage settlement. Since Ballinakill was first in the hands of Henry Bomford in 1826 and 1832 he was probably the eldest son. Henry died sometime before 1846 when his child Augustin was a minor, so Oliver had the place. Oliver was at Stonehall with his father in 1805 and there again or still in 1823, at Ballinakill in 1826, at Stonehall again in 1837, and back in Ballinakill in 1846. By 1850 he was living in Mullingar and had leased Ballinakill. Oliver was still in Mullingar in 1853 and that is the last date he is mentioned. Another brother was John of Blackhills. John was the third son and his property was Cumberstown (1832), but in 1846 he was at Blackhills where he died in 1850 without children. By 1853 the only surviving brother was Oliver. His sister, Elizabeth, was a widow living in Mullingar. Her husband, John Smith, had died before 1853. It is not known whether they had children. There may have been another sister as implied by Elizabeth's marriage settlement, but if so nothing is known about her except that she is not mentioned in the 1853 deed so presumably had died by then, if indeed she ever existed. Possible descendents of this branch of the family are John Oliver Bomford, shoemaker of Mullingar, probably born in or about the 1820s, and his descendents (17.5.6). These two Bomfords, both named John, are recorded in the Dublin Almanacks. Surgeon John Bomford 1796. John Bomford was commissioned a surgeon in the North Mayo or 3rd Battalion of the Militia on 22nd November 1796. This was a large battalion of seven companies and John would have seen service during the 1798 invasion of the French into Mayo. One assumes he would be at least 25 when he became a surgeon, which would indicate a birth date of about 1770. This would place him about the same age as John, second son of Thomas of Clounstown and Harristown, and John of Lisgomell. John Bomford of the Co Longford Militia, 1809-1816. This John Bomford was gazetted Ensign on 24th June 1809 in the Co Longford, or 15th Battalion of the Militia with headquarters in Newtownforbes, north of Longford Town. Gazetted Lieutenant on 25th July 1811 and appeared as such until 1816. They are no entries in 1817 so he must have resigned that year or died. If he did die then he is probably John of Lisgomell who died in 1817. On the other hand John of Lisgomell would be about 46 in 1809 and I would think that age would be rather old for an ensign. I would expect an ensign to be in his early 20s, which would make his birth date about 1790, and so it is more likely that the ensign is John of Blackhills. Again there is insufficient documentation but it is most likely that the surgeon John is John of Lisgomell who I assume to be John the second son of Thomas of Clounstown; and that Lieutenant John is the surgeon’s son, John of Blackhills. Note 1: Thomas inherited the rents of Cumberstown in 1762 (7.18.1) (Chapter 5), for his children and the debts of Clounstown, 14.5. Note 2: Inherited 1825 Mount Jessop and took the name of Jessop, becoming Bomford-Jessop (14.8.2). Later information suggests Robert was born c1773. Note 3: Family legend (from Jim Bomford) states that Henry was an explorer and had a mountain named after him. If so, it might be Bomford Hill, Chattahoochee, Georgia, USA, though Colonel George Bomford would seem a more likely candidate to have a hill named after him. Note 4: Augustin fought and killed an English soldier and had to flee from Ireland to USA c1860 and so lost Ballinakill to the Head Landlord, Lord Nugent. Joined the Union Army and fought at Gettysburg (1863). Boxed, bare knuckle, and won against John L. Sullivan (1858-1918) for the rights of Brooklyn longshoremen to work in Hoboken Docks. He was the great-grand-father of J M Bomford (Jim) who has medals, weapons and papers etc relating to Gus. Augustin and his wife Kate died between 1920 and 1930 according to census records. Note 6: In 2005 Jim stated “I am a retired NYC cop, wounded in the line of duty, went to Florida and became a politician and was elected Fire Commissioner, and now serve as a government consultant in New York”. Jim’s mother, Margaret, died nine days after he was born so he was raised by his father’s sister, Catherine Mary and her husband John William (Willie) Wallace, together with their children: Theresa Wallace, Roseanna T. Wallace, and John (Jack) Wallace who died in 1972 in an auto accident. More on Jim Bomford and his branch of the family, including information on births and deaths. Note 7: The Internet lists another son of Augustin and Katherine, named Oliver Bomford born c1886 in New York. Oliver, from the census records, is the same person as Alfred from the birth and death records as explained by Jim Bomford. Served in Army in 1917/18. The census records show him living in New York in 1930 and that he married Margaret Roseanna St John in about 1909. A. Grandfather (of Jim Bomford) in his brogue arranged the baptism with the Italian or Polish clergyman and stated that he wanted his son named “Allie” (Alfred). The clergyman mistook this for “Ollie” (Oliver). The water was poured and the words were said, “I baptise thee Oliver Peter Bomford”. Mother, although furious about the error, would not allow anyone to correct it once the ceremony had taken place, so Alfred was stuck with the name Oliver. B. Both father and son worked for the New York Fire Department but also as steam fitters in the Brooklyn navy yard. The father worked on the battleship USS North Carolina, and for a funeral home during the 1917 influenza epidemic. At one stage he also worked in a carpet factory. C. The son married and had five children: Alfred (Skipper) worked with Xerox in Brooklyn; Richard; John of New York Police Department; Elizabeth; and Margaret. Note 9: Ballinakill. According to papers with Jim Bomford, Ballinakill was composed of tenant farms and at least two “manor houses” (one of which might be Lisgomell). When Henry died (c1845) his property would have been left to his eldest son Augustin, but he was a minor so it went to Uncle Oliver. The deeds show that Oliver occupied Ballinakill in 1846, 1847 and 1853. Augustin was aged 10 in 1853 and would have be a minor until 1864, the year after Gettysburg, so by that date he was in America having been smuggled out of the country by Paddy Igoe after killing the English soldier. Ballinakill had to be forfeited by Augustin since he could not return to Ireland to claim it as he might well have been arrested. Augustin came of age in 1864 and Oliver, his uncle, then aged about 54, would have held Ballinakill until that year. It may then have reverted to the Head-landlord, Sir Percy Nugent of Donore which joins Ballinakill to the west. According to Jim’s papers there was a dispute over Ballinakill which was recorded by a Mary Bomford Burns (probably a Mary Bomford that married a Burns, but possibly the daughter of a Bomford that married a Burns - no records have been found to support either interpretation; but there are also letters from a Teresa Bomford Byrne, who has been traced in census records, though her parents are not known, so Mary may be a mixup for Teresa?). This account was found with the Upton Papers, packet 25 number 220 in the Royal Irish Academy, Dublin, and it has been printed here in full. The document concerns Thomas Bomford, the eldest son of Thomas and Alice Bomford, who was born at Clounstown about 1764 (14.8.1). Unfortunately the document is not dated but it must be between 1792 and 1797, and probably about 1796. Account of Thomas Bomford from a Chancery Answer of the Rev Thomas Jessop, LLB, in the action of Thomas Bomford V Rev Thomas Jessop. The said Thomas Bomford being, at the death of Thomas Jessop (his grandfather), a boarder at the school of Rev John Donden, in the town of Longford, where he had been sent in the year 1775 by the said Thomas Jessop, the Rev Thomas Jessop (his uncle) continued him at the said school, and paid for his board, lodging and tuition, until the year 1779, when the Rev Thomas Jessop, thinking that Thomas Bomford who was then at the age of 16 years or thereabouts, was not making sufficient progress in his learning at the said school, removed him to the school of Rev Francis Kenny, then Diocesan Schoolmaster of the See of Elphin, as a boarder where he continued from that time until October in the year 1783 when he was dismissed there-from as herein afterwards mentioned, and was afterwards put to a school of a Mr Banks, and the Rev Thomas Jessop during the whole of the aforesaid time paid for the tuition, board, clothing and lodging a greater sum in each year than the annuity left for that purpose, by the will of Thomas Jessop. The Rev Thomas Jessop further saith it is not true that Thomas Bomford left school for the reasons in his Bill untruly stated, on the contrary thereof he was dismissed from said Kenny’s School for improper conduct as hereinafter mentioned, for he heard and believes that Thomas Bomford instead of paying the necessary attention to his education became idle and inattentive, and some years before he was dismissed from the said Kenny’s School he contracted an acquaintance with one James Armstrong, a horse rider, and a man of a most abandoned and profligate course of life, and who was afterwards executed for a robbery, and that he became so fond of his company that he frequently absented himself from School for three weeks at a time, under a pretence of being on a visit to his grandmother Katherine Jessop (at Mount Jessop) and that he deceived the said Francis Kenny on those occasions by causing letters to be forged as if from the said Katherine Jessop to the said Francis Kenny requesting his permission for him to visit her or to that effect, and on these occasions instead of visiting his said grandmother would go in company with the said James Armstrong up and down the country and spent their time in dissipation and debauchery, and then return to school as if from his grandmother Jessop’s house, and the said Francis Kenny, having at length detected him in such improper conduct and also in several other profligate and improper acts he dismissed him from his school, and wrote a letter to the Rev Thomas Jessop informing him of his improper conduct, and that he, although he had used his best endeavours for that purpose, found it impossible to reclaim him, and had therefore sent him home. The Rev Thomas Jessop was very much irritated at such the conduct of Thomas Bomford, who was then of an age near 21 years, but nevertheless he shortly afterwards put him to the school of Mr Banks, where he remained until the year 1784, and after he had left, the Rev Thomas Jessop gave Alice Bomford his mother, either 5 or 6 Guineas, which he does not recollect, to buy him cloaths, and at the same time informed her that it depended on his future behaviour whether he would show him any countenance, or advance him any further sum or not, at the same time observing that he did not consider himself bound to advance him any further sum as he had then obtained his age of 21 years, more especially as the portion of Margaret Montford, alias Jessop, was a charge on the lands of Ardnacraney, and was not paid off to which the said Alice replied that she was satisfied that was the fact, as an eminent lawyer who had been consulted saith. The Rev Thomas Jessop saith that he did not direct the tenants on his lands not to receive or harbour or sustain the said Thomas Bomford, but he believes the said tenants might have refused to receive him, on account of his abandoned and loose behaviour, which made him a terror to every person acquainted with him. Thomas Bomford on his leaving Mr Bank’s School went to the house of Katherine Jessop, his grandmother, where he was received and resided as often as he thought proper, and instead of amending his former course of life, became more abandoned, and would stay away for weeks and months together, and whilst absent associated with the most abandoned, idle and profligate persons in the County, and in order to support his extravagance and debauchery had recourse to the worst of means, and particularly at one time he took away from his grandmother without her knowledge or privily four milch cows, and sold them at the fair of Multyfarnham the following morning, and at other times he in like manner took away from her a horse and two plough bullocks which two bullocks were worth a sum of £18 each, and sold and disposed of the same respectively and applied the money to his own use, and the said Katherine was at length afraid to keep any horses for fear he would take them away and sell them, and he was charged by different people in the county for stealing several horses, and that such persons would have prosecuted him for same, had it not been for the interference of the Rev Thomas Jessop, and he was charged by one Magarry, a tinker, with stealing a horse from him, and that the said Magarry swore examinations against him for such alleged offence before the Rev Archdeacon Beatty who granted a warrant thereon for his apprehension, and he was taken up in the town of Bailyborough in the county of Cavan for having horses supposed to be stolen in his custody, and that on his so being taken into custody, he alleged that the said horses belonged to the Rev Thomas Jessop, whereupon the magistrate before whom he was taken, wrote a letter to the Rev Thomas Jessop informing him thereof, requesting to know if the said horses were really his property or not, and Thomas Bomford about the same time wrote a letter to the Rev Thomas Jessop requesting he would acknowledge the said horses to be his which he refused to do and wrote for answer, as the fact and truth was that the said horses did not belong to him, and the Rev Thomas Jessop had been informed that the person to whom the said horses actually belonged having come to a knowledge where they were, he claimed and got the same, and permitted Thomas Bomford to escape without prosecution. Shortly after the last mentioned time, Calib Barnes Harman, late a representative of the County of Longford, since deceased, alleged that Thomas Bomford stole a mare from him, and that being closely pursued he cut off the ears and tail of the mare, and left her on the high road, and the said Caleb Barnes Harman being a particular friend of the Rev Thomas Jessop and knowing that Thomas Bomford was his nephew, he for that reason declined to prosecute him for the said offence but observed that he was a dangerous man and should be put out of the country. His relatives then considering that it would be much more to his advantage and for the credit of his family that he should leave the Kingdom for some time, as one person in particular had sworn information’s against him for an offence therein mentioned, upon which his two brothers and a steward of Katherine Jessop, went to County Westmeath where he had been taken and arrested, and then was, and in which County his father Thomas Bomford, since deceased, was also, and having found him, with the knowledge of Thomas Bomford the elder, he came to Dublin accompanied part of the way by his two brothers, where upon a further consultation of his relatives, it was thought advisable to enlist him in the Service of the English East India Company and send him to India, hoping that he would in such service be convinced of his former improper conduct and become a useful Member to Society, and on his being informed of such intention he readily acquiesced thereto. (This paragraph appears to have been deleted). The Rev Thomas Jessop said that several officers and military agents of the English East India Company were at this time in this Kingdom seizing and enlisting men for the Company. Having thus come to the City of Dublin he voluntarily enlisted in the aforesaid service, and he was supplied with clothes and all other necessaries for the voyage and some money by the Rev Thomas Jessop, and wrote to the said Thomas Jessop a letter, dated 22 of March 1789, in which he stated among other things that he was extremely obliged to him for his kindness to him, and that he expected to be very happy in India: and would take care to behave in the best possible manner, and further said the Lord Mayor came here yesterday and anyone that was an apprentice or unwilling to go to India, and said he would rather stay than go, he took them back, and they were at no expense, he set them loose on shore, and when he asked me I told him I would not return for 500 pounds. There went ashore eleven out of 120 men. And in another letter dated 1st March 1790 from Gravesend he mentions among other things that 40 men had deserted on their travels from Liverpool to Gravesend, and that although he had been solicited to desert likewise, all the men living would not get me to do so. The Rev Thomas Jessop then wrote letters of recommendation about Thomas Bomford to Arthur Ahmuty, a relative of his, then a Colonel in the East India Service in India, and therein requested that he would forward Thomas Bomford in promotion if he found his conduct and behaviour merited such treatment, and promised that he would from time to time, send him money for the use of Thomas Bomford and he might send him £20 a year provisional upon ‘Thomas Bomford conducting himself with prudence and propriety’. Thomas Bomford sailed for the East Indies, for a term of five years, but before this expired he departed from the service at St Helena, from whence he procured a passage to Limerick in a Dutch ship and arrived there in the month of September last (possibly 1791), in a sailors jacket and trousers. Had it not been for Thomas Bomford’s improper conduct he would have obtained promotion soon after his arrival in India having presented the Rev Thomas Jessop’s letter to Arthur Ahmuty, and some time afterwards he endeavoured to procure from him a sum of money by improper means, he thereby forfeited his good opinion and favour. Shortly after Thomas Bomford’s return to this Kingdom he went to the County of Longford, where he apparently stopped at the house of one Charles Farren who kept a Public House, and was a tenant on the Jessop estate, and when he and other disorderly persons got intoxicated, made foolish speeches using many very improper expressions, owing to this the Rev Thomas Jessop informed Charles Farren that if he continued to harbour him, his licence would be taken away. In order to prevent a return to his former state of life, the Rev Thomas Jessop sent his brothers John and Robert Bomford to see him and to promise him nine Guineas if he would quit the Kingdom, to which he readily agreed, and his aunt Margaret Montford promised a further sum of nine Guineas, which sum having been given him, he, accompanied by his brothers, went on board a boat in the Liffey which he pretended was to put him on board a ship in which he was to proceed on his voyage, but he shortly after returned boasting how he had deceived and swindled his uncle and aunt out of their money. The saga ends there abruptly at the end of a page. There may have been another page but it is no longer to be found. There is obvious cause for an action here and no doubt Thomas Bomford lost the case, but, and this is conjecture, there was probably more to the case than just Thomas being a troublemaker. www.longfordancestry.com, citing RSJ Clarke, says Thomas 'was robbed by his uncle Thomas while a minor, against whom he drew up a bond about 1796 May'. Thomas’s grandfather, Thomas Jessop, and his wife Katherine had at least two daughters, Alice who married Thomas Bomford of Clounstown, and Margaret who married Mr Montford, and two sons. Grandfather Jessop died in 1776 (probate) and Mount Jessop passed to his elder son Robert Jessop who died in 1784. The other son, Rev Thomas Jessop, inherited Mount Jessop, and the rest of the property, which included Ardnacraney, in 1784 from his brother, as confirmed in Canon Leslie’s Register. 1784 was also the year that Clounstown had to be sold and Thomas and Alice Bomford had to move elsewhere. Undoubtedly Thomas was short of money for not only had he to sell Clounstown but his eldest son Thomas was already being educated by his Jessop grandfather and being groomed for eventual inheritance of the Jessop lands. As early as 1784 it was probably foreseen that the Jessop entail would fall on the school-boy Thomas Bomford since the Rev Thomas Jessop had no children and was then aged 43 so not likely to have any. The move out of Clounstown occurred that year and the family most probably moved onto leased Jessop property Harristown or Harrystown. It remains a grey area but Ardnacraney belonged to the Jessops; this move makes sense since the eldest son would eventually inherit the property. Thus it was important that the eldest grandson, Thomas Bomford the subject of this court case, having proved himself unsuited to inherit, be disinherited by law so that the entailed property could be passed to the second Bomford grandson, Robert. In fact Robert Bomford did inherit Mount Jessop and the rest of the property on the death of his uncle, the Rev Thomas Jessop, who died without children on 24th April 1825. Robert Bomford assumed the name Jessop by Royal licence dated 11th May 1825 and took over the Jessop estates. Reading between the lines it is interesting that throughout the Chancery Answer the Rev Thomas Jessop deals with his sister Alice and only once is Thomas Bomford her husband mentioned; one would expect the father to discipline his errant son. The text reads as though Alice and her husband were living apart, and one gets the impression that Alice was living fairly close to the Rev Thomas Jessop in Co Longford and that her husband was living in Co Westmeath and probably at Ardnacraney. Thomas of Ardnacraney died before the court case came up but was alive in 1796 in February (deed of 14.1), so he probably died later that year, aged 51. The relationship of “Arthur Ahmuty then a Colonel in the East India Service” is not clear. From the wording of the text he could be either a relation of Thomas Jessop or Thomas Bomford. It is possible that he was a relation of the Jessops (see below) but it is more likely that he is a relation of young Thomas Bomford. In 1766 Dorcas Ahmuty married John Bomford, a brother of Thomas of Clounstown and Ardnacraney and so an uncle to the Thomas of this case (see 14.10). I have been unable to place Arthur Ahmuty into the family tree which follows (14.10.5) since he is not in the deeds [he was a son of Samuel Achmuty and Mary King in the tree at 14.10.5]; however I have found other Achmutys, all with a connection with India. A possible son of Colonel Arthur might be James Ahmuty who was commissioned in 1790 into the Artillery of the Company’s troops. In 1824 James became a full Colonel of the Indian Artillery and was acting as Major General in charge of the Bengal Artillery. Another Indian connection was John Auchmuty, Chief Judge of the Surpreme Court of Calcutta, who married Caroline Warren, born c 1810, daughter of Peter Warren of Henrietta Street Dublin. Their son may have been Captain Warren Auchmuty, who served with the British 98th Regiment of Foot; his regiment was in Chusan, China and then moved to India where in 1849 at Lahore Warren was ADC to yet another Auchmuty, Major-General S B Auchmuty CB. The spelling of Ahmuty appears to have slowly changed to Auchmuty; the present spelling is Achmuty. Lieutenant Colonel Ahmuty in 1779 [the same man as 'Arthur Ahmuty then a Colonel in the East India Service'above] was commanding the cantonments around Midnapore, about 70 miles west of Calcutta, according to The Parliamentary Register: Or, History of the Proceedings and Debates of the House of Commons, by Great Britain, Parliament (text available on line through Google Books) in a report starting on page 447 regarding a dispute between the Supreme Court in Calcutta, the East India Company and the Governor and Council. Achmuty's troops included, on 3rd December 1779 (page 450), a Lieutenant Stephen Bomford (page 452) who may well be David Bomford's illegitimate son (11.9). The given name of that Ahmuty is not stated. He may well, though, be the Major Arthur Ahmuty listed in Baptisms in Calcutta: 1767 to 1777. According to that document, the registers of St Johns Church record that Major Arthur Ahmuty and his wife Ursula baptised a son Richard on 15th October 1774 and a son Samuel on 13th January 1777. Footnote (58) in the document says of the son Richard, "Richard Ahmuty: query: writer on the Bengal establishment, 1791: Commissioner of Behar, 1797: Collector of Allahabad, 1803: Judge and Magistrate of Furruckabad, 1804. Proceeded to Europe, 1806, and resigned in England, March 30, 1808". The Rev Thomas Jessop's paternal grandmother was Margaret Achmuty daughter of Arthur Achmuty of Brianstown (www.longfordancestry.com, citing Burke's Landed Gentry 1846 edition but noting that Margaret Achmuty married Robert Jessop, not Anthony Jessop as stated in Burke, and had 7 children including the Rev Thomas Jessop's father Robert Jessop). William Bomford of Cushenstown had two brothers, Thomas of Clounstown (above) and John. The next few deeds concern John. John was born about 1740. He and Thomas were apprenticed to some business in Dublin and when their father made his will in 1754 they had started their apprenticeship and they were bequeathed £500 each to be paid on completion of their apprenticeship; the trustee for this bequest was their uncle John Bomford, one of the younger sons of Oliver Bomford of Cushenstown. Some time before his marriage he was a merchant in Dublin, no doubt helped in setting up his business by the £500. Unfortunately it is not known what his trade was, perhaps brewing or distilling like his brother-in-law Wilson Bomford. He married Dorcas Achmuty in November 1766. She was born c1745. Dorcas Achmuty, of the City of Dublin, spinster, is entitled by the will of her late father, Samuel Achmuty late of Brianstown, Co Longford, to £900 sterling charged upon the land of Brianstown and to other legacies upon her marriage to John Bomford, merchant of the City of Dublin. John Lowther of Staffordstown (7.18.1). 1. John Bomford, late of Dublin, merchant, but now of Killincarrick, Co Wicklow. 2. Samuel Ahmuty of Brianstown, Co Longford, only son and heir of Lieut Thomas Ahmuty deceased who was the eldest son and heir of Samuel Ahmuty of Brianstown deceased. 3. Rev Samuel Ahmuty of Ballymulrey, Co Longford, a younger son and executor of Samuel Ahmuty deceased. Dorcas (Achmuty) was alive in August 1777 but, since John remarried in 1788 (14.11), she must have died before then. They had no known children. One wonders whether the death of Dorcas was the reason why her nephew Samuel Achmuty of Brianstown refused payment to John Bomford. From these deeds, those in 8.1 and other sources, we are able to draw up a probable family tree of John Bomford’s ‘in-laws’. The names Ahmuty, Auchmuty and other variants have been changed to Achmuty here. Corrections to Peter Bamford's original conclusions in this section have been provided by Clare Eagle, who is compiling extensive information on the Achmuty family (emails 10, 13 & 27 April 2009). In the late 1600s Arthur Achmuty was living at Brianstown, Cloondara, where the Royal Canal meets the Shannon in Co Longford. He died in 1699. His elder son, Captain Arthur, died before he did, in 1692, so his grandson, Thomas, inherited. The younger son was Captain John Achmuty, and Arthur also had a daughter Catherine who married William Lawder who died in 1715. The Arthur who died in 1692, predeceasing his father, had a daughter Margaret Achmuty who married Robert Jessop (14.9.4). The grandson Thomas Achmuty, lieutenant, of Brianstown married Dorcas, a daughter of Samuel Townley. After Thomas died in 1712 Dorcas married, as his second wife, James Lawder of Kilmore, who died in 1749. James and William Lawder were brothers (see 8.1.3). Thomas and Dorcas had five sons: Samuel Achmuty who married Mary King (14.10.5) and had a daughter Dorcas who married John Bomford; John Achmuty ‘lost at sea’; Thomas Achmuty, wine merchant; Townley Achmuty, wine merchant; and Arthur Achmuty, a surgeon. Samuel Achmuty (see tree below) built Brianstown House in 1731 of two storeys over a basement on the site of the old house. After a fire in the 1900s the house was reconstructed without the upper storey. a. John Achmuty. Became Chief Magistrate of Mullingar. 2. Isabella, who was unmarried and living at Bellmount in 1770. 3. Elizabeth, married Francis Savage. 7. Samuel Achmuty, Rev, of Shrule Parish, Ballymahon, married Suzannah Maria Savage and had issue (Clare Eagle email 10 Mar 2009). 1. Mary Ann Barrington is entitled to an annuity of £75 during her lifetime chargeable on premises in Saint Thomas Street, Dublin. 2. She is also entitled to £350 on a mortgage by John Barrington, tallow chandler of Dublin. The memorandum of this settlement in the Registry of Deeds says the settlement is dated 1780. The Diocese of Dublin gives the date of the marriage licence (page 455) as 1788. Bill Riley has seen the original Parish records which record the marriage on 9 October 1788 (17.2.3): so the problem appears to be with the date recorded in the Registry of Deeds. The deed has been rechecked and it says in words one thousand seven hundred and eighty but it is suspected that the word eight was omitted by mistake. The memorandum of the deed is dated 20 October 1788 (Eva North email 22 Feb 2009). It is thought that perhaps John’s move out of Dublin to Killincarrick coincided with his second marriage. He would then be about 40 years old. Nothing was known about Mrs Mary Ann Barrington, not even the name of her family though she might be related to the two trustees. Norm Wakefield (email 17 Feb 2009) advises that Mary Anne Barrington (nee Plummer) was the widow of John Barrington (1723 – 1784). They were married 11 Sep 1763 in Enniscorthy, Co Wexford, and had 3 children - John Barrington, 1764-1824; William Barrington, 1767-1770; and Edward Barrington 1769-1771. Norm's records indicate Mary Anne was born about 1727 in Enniscorthy, Co Wexford, to William Plummer and an unknown Stephens. The Barringtons were prominent in Queen’s County from about 1558 when given land at Cullinagh by Queen Elizabeth I. John Barrington is recorded as dying in 1784, casting further doubt on the recorded date of the marriage settlement (1780). It is thought that perhaps John Ryder of Bellpark is a brother or a nephew to John’s sister-in-law, Charity Ryder, who married William Bomford in 1754 (7.17). Rathdowns has not been investigated, but Rathdown Castle is 2 miles north of Killincarrick on the north side of Greystones, and this may be the location of these 50 acres. There is only one other deed concerning John Bomford, that of July 1810 (17.2.3). It would appear that after living in Dublin as a merchant he moved around a bit, but always in Co Wicklow; Killincarrick in 1780, Upper Rathdowns in 1795, both outside Greystones, and lastly by 1810 in Delgany. In 1810 John would be about 70 so he probably died there, the date is not known. Bill Riley (Leonard Riley email 13 Jan 2009) has seen Delgany Parish records which record that a John Bomford of Bray, Co Wicklow, died on 18 March 1813 aged 60 (17.2.3): he seems to be too young to be this John and has been included in the unplaced Bomfords (17.10.5). There are two deeds that give most of the information about the daughters. These are the Trust in the Will of Thomas who died in 1757 (7.18), and the sale of Clounstown (14.5); however some additional information has come to light. Anne, the eldest daughter, must have been born around 1733. She married her cousin Wilson Bomford, a grandson of Colonel Laurence, in January 1759 (12.2.5). They lived in Dublin and had three boys (12.2.8, .9, and .10). Anne died sometime between the 1764 Trust and the sale of Clounstown in 1784; Wilson died in 1790. Elizabeth was born in 1734; there is no evidence that she married. She was alive in 1764 but since she was omitted from the 1784 deed it is assumed that she died between those two dates. Frances was born at Clounstown about 1731. On 26th Febraury 1753 (ML) at Clounstown she married Robert Madden of Meadesbrook, which is adjacent to Cushenstown. They had three children (7.16). Frances was not included in either of the two deeds and so must have died before 1764 but after her third child was born around 1760. Robert did not die until not long before 1787 or just after 1787, depending on the interpretation of the next deed (14.12.4). Emilia was born about 1742. In 1787 she married Robert Harrison of Santry, Co Dublin. Nothing is known about her husband or if they had any children, nor is it known when they died. However we do have the Marriage Settlement. Because of the marriage about to be solemnised between Robert Harrison of Santry, Co Dublin, and Emilia Bomford of Curraghtown, Co Meath, spinster, and, because Robert Madden senior, of Curraghtown, owed Emilia Bomford £300, which sum was used to pay back the mortgage on Curraghtown. Now Emilia Bomford is confirmed in that part of Curraghtown formerly in the possession of Michael Carroll deceased, and now in the possession of Robert Madden junior, containing 13 plantation acres (21 statute) in the Parish of Duleek, until the £300 is repaid. The interest (rents) from the land and the £300 is placed in trust to Joseph Rathborne of Ballymore, Co Meath, and William Bomford of Dublin for the children of Emilia and Robert Harrison. Apart from the period of the mortgage, Curraghtown, where apparently Emilia was living, belonged to Robert Madden senior, Emilia’s brother-in-law; the land is just south of Bellewstown. Robert and Frances, Emilia’s older sister, had three children (7.16): John who is not mentioned in the deed became a clergyman; Robert who is mentioned in the deed as Robert Madden junior; and a daughter, Anne Madden, who was probably the oldest; in 1774 she married Joseph Rathbourne (13.9.4) who is the trustee for his Aunt Emilia’s children in her marriage settlement. The other Bomfords mentioned are William, Emilia’s oldest brother and the two who witnessed the deed, Laurence and Thomas Bomford of Dublin. Laurence is Emilia’s nephew, the son of her sister Anne and her brother- in-law and cousin Wilson Bomford. Thomas was probably Laurence’s younger brother who was at Trinity at this date; the only other possible Thomas was her brother Thomas of Harristown in Co Westmeath. This deed is backed by the Marriage Licence Bonds Prerogative, which reads “Bomford Emilia and Robert Harrison ML 1787”. Nothing is known about Robert Harrison or his family and it is thought that they had no children since Emilia married so late in life, being about 45. Luckily the will of her mother (14.4) tells us much about Jane, otherwise we would know little about her. She was born about 1744 and married about 1st January 1770 Samuel Heally, or Heatly (14.4.1), he died before 1784 having had two sons Gabriel and Samuel Heally. Jane died after 1784 but she does not appear again in the documents. Christian is the youngest and was born about 1746. It would appear that she had two marriages; the first one so short that I have been looking out for another Christian but have failed to find one, so I think the two marriages are both hers. The first marriage licence is to be found in the Diocese of Meath Marriage Licence Bonds and reads “Bomford Christian and Francis Hopson ML1782”. It may be that Christian never married Francis Hopson, but if she did he must have died almost immediately, because in the deed of 4th April 1783 (14.5) concerning Clounstown we find her married to Christopher Russell; the extract reads - “Christopher Russell of the City of Dublin and Christian Russell otherwise Bomford his wife...”. Thus Francis Hopson must have died the same year as his marriage. Nothing has been found concerning him or his family. There are several of this name recorded and all are written below, since I am uncertain which one might have married Christian Bomford, Mrs Hopson, and another document may come to light to clarify the situation. 1811 Christopher Russell Carpenter of Hardwick Street, Dublin. Either of the last two might be our Christopher. The 1790 will in Betham’s notebooks could not be found. The 1811 will must be considered as lost in the Court House fire and this leaves the 1755 will to be found sometime in the Betham notebooks though this is too early to tell us whom a possible son married. 1. Christopher Russell, born 1799 (or 1801 according to the Trinity Register) in Galway, educated TCD. 2. Cecil Russell, born 1803 in Galway, BA TCD 1823, MA 1832, Rector of Drumcree (Meath Diocese) 1860-72, died 29th August 1881. 3. Philip Russell, born 1812 in Galway, MA TCD 1838. The dates of this Christopher match sufficiently well but I have my doubts that he is our man for two reasons; firstly although there were periods spent in Dublin the family appear to have lived in Galway as both Christopher and his sons were all born there; secondly there seems to be rather a long gap between the marriage date of 1783 and the birth of the eldest son in 1799. Thomas Bomford, of Clounstown and Cushenstown, Co Meath, BA TCD 1725, born 1703, married (ML) 7th September 1729, Jane daughter of Richard Shinton of Gerardstown, Co Meath (3.4). He died in 1757 and she in 1785, leaving issue. 1. William, of whom presently (Chapter 17 completes his family). a. Anne Madden, born c1754, married in June 1774 Joseph Rathborne of Ballymore, Co Meath, eldest son of William Rathborne of Dublin. b. Reverend John Madden, born 1758, BA. TCD 1781 and died May 1845.
c. Robert Madden, born c1760. a. Laurence, brewer of Dublin, born c1760, alive 1803.
b. Rev Thomas Shinton Bomford, born 1762 died 1844 at Woodbridge, Suffolk. c. Wilson Bomford, born c1764 alive 1803. 4. Elizabeth, born c1734, died unmarried between 1764 and 1783.
a. Thomas Bomford, born 1764, disinherited about 1797.
c. John Bomford, born 1763 or c1768 (see 14.8.3). 6. John, born c1740, merchant of Dublin, then in 1780 of Killincarriok, Co Wicklow, married firstly 27th November 1766 (ML) Dorcas, daughter of Samuel Ahmuty of Brianstown, Co Longford, and married secondly 1780 Mary Ann, widow of Mr Barrington, of Dublin. No known children. 7. Emilia, born c1742, married 1787 Robert Harrison of Santry, Co Dublin. No known children. a. Gabriel Heally, born c1771. b. Samuel Heally, born c1773. 9. Christian, born c1746, married firstly 1782 (ML) Francis Hopson who died that year, married secondly before April 1783 Christopher Russell of Dublin. No known children.